Today's June Job Openings and Labor Turnover report once again shows job openings exceed the number of hires for the month by 1.0 million. 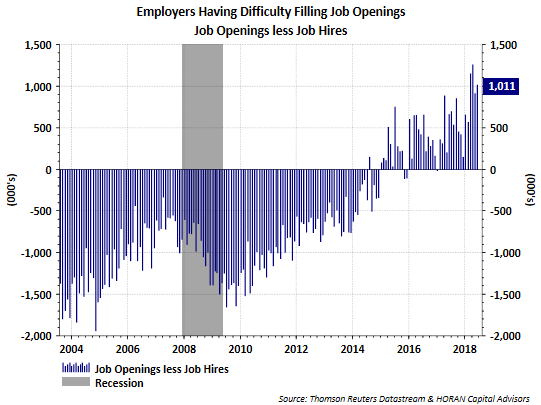 This continued trend higher in openings versus hires is a sign employers continue to have difficulty filling open positions. 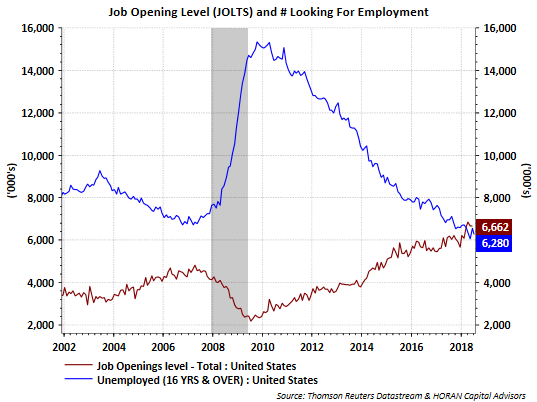 Additionally, again in June, job openings continue to exceed the number individuals looking for employment. Openings increased to 6.662 million versus 6.659 million in the prior month. May's openings number was revised higher in today's report as well. The number of individuals looking for employment equals 6.280 million. "Labor markets were described as tight, with most Districts reporting firms had difficulty finding qualified labor. Shortages were cited across a wide range of occupations, including highly skilled engineers, specialized construction and manufacturing workers, IT professionals, and truck drivers; some Districts indicated labor shortages were constraining growth [emphasis added.]"